NZ Sculpture onShore is New Zealand's largest and most established outdoor sculpture exhibition. First held in 1996 in a private garden in Takapuna, the event grew so much in popularity that in 2004 it moved to the spectacular Fort Takapuna Historic Reserve on Auckland’s North Shore. The exhibition, which features work from established and emerging artists, provides a unique snapshot of contemporary three dimensional art practice in New Zealand. This includes monumental stand-alone sculptures, domestic and small-scaled works, ephemeral projects, light and sound art works, process art and many site-specific installations. All of the works exhibited at NZ Sculpture onShore are for sale during the exhibition and proceeds from each exhibition are donated to Women's Refuge. To date over $1.5 million has been donated to help Women's Refuge support the victims of domestic violence in New Zealand. Visitors to this year’s exhibition can also enjoy "A New Light" event experience. Over two nights, selected areas of the site and exhibition will be lit, illuminating the sculptures and historic landmarks including the fort. 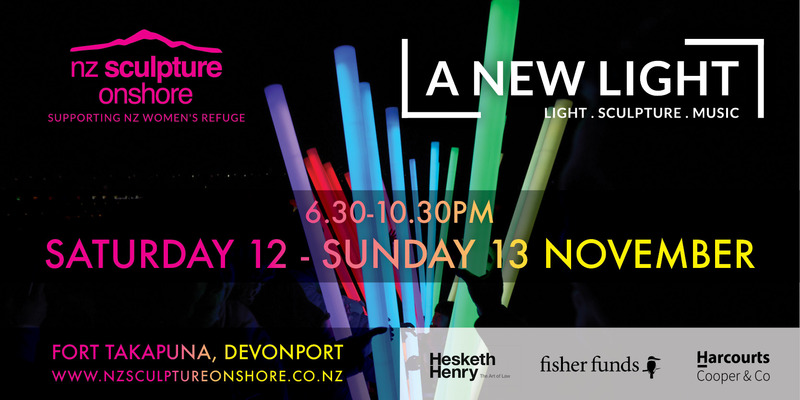 This combined with a feature neon installation by artist Paul Hartigan and other renowned light and mixed media artists and designers, coupled with live music and fabulous food on offer, promises to be a fantastic new edition to the NZ Sculpture On Shore programme. The New Light will be staged Saturday 12th and Sunday 13th November from 6.30-10.30pm, with DJS R.I.A. Sam Evans and Dylan C on Sat 12 Nov and live music from Anna Coddington and Miloux on Sunday 13 Nov.
NZ Sculpture onShore Limited is wholly owned by Friends of Women's Refuges Trust, and is very much a community initiative. The vast majority of those involved in planning, organising and staging NZ Sculpture onShore are volunteers - well over 250 in 2014. This not only allows us to keep overheads to an absolute minimum, but provides an opportunity for a large number of people to be directly involved with the exhibition and to contribute to the work of NZ Women's Refuge.